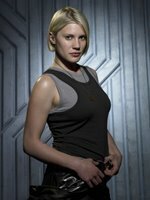 Ron Moore and the Sci-Fi Channel are working on Caprica, a prequel series to BSG taking place 50 years before the current events taking place on Battlestar Galactica. Ron Moore, has updated his Battlestar Blog with a new Q&A session. He detailed more about his time in the NROTC and training cruise on board the USS W.S. Sims FF-1059. Katee Sackhoff reveals to Sci-Fi Wire a few pieces of information for season 3 of BSG, currently filming in Vancouver, Canada. Look for Starbuck to have a major haircut in season 3. 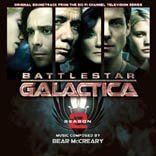 BSG News has posted the cover art for Bear McCreary's season 2 Battlestar Galactica soundtrack from La La Land Records. Battlestar Galactica has won the Peabody award.